Torque ratings 3 - 300 lb.ft. During the braking procedure, the rotor (3), which can be shifted axially on the hub (4), is pressed against the counter friction face (6) via the armature plate (1), by means of the compressions springs (2). 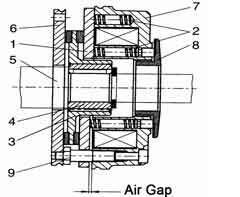 When the brake is applied, an air gap is present between the armature plate and the stator (7). The brake is released electromagnetically. The stator's coil is energized with DC voltage in order to release the brake. The resulting magnetic flux works against the spring force to draw the armature place to the stator. This releases the rotor from the spring force and allow it to rotate freely. Available with a torque adjust ring (8) to reduce braking torque (Model D58).